Mount Cameroon Race Of Hope: Did Gunmen Shoot Athlete Out Of Envy? Samuel Lyonga Esombe, son of crowned Queen of the Mount Cameroon Race of Hope, Sarah Liengu Etonge, was attacked and shot on the leg by gunmen in December 2017, which his coach sees as an act of envy. Essombe, 29, was attacked in his home by gunmen and after struggling with them, he was shot on the leg and also sustained injuries on his fingers and head. The injuries sustained by the two times (2015 and 2017) second runner up of the Mount Cameroon Race of Hope, could see him miss the 2018 race, which many had tipped him as winner. Speaking to the press on Sunday, January 14, Essombe’s trainer, Reginald Esuka, believes the evil act might have been perpetrated in order to stop Essombe from running the Mount Cameroon Race Of Hope this year. This, to him, is because the gunmen said they came to kill Essombe. However, he went ahead to say that, by God’s grace, Essombe will be back soon and ready to compete again. “The doctor gave us some hopes that he may run, but my fear is that he is not training. As his trainer, three years ago, I didn’t want him to go beyond 3rd position, but I really wanted him to participate and win this year,” Esuka averred. 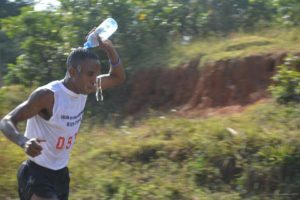 Lyonga Essombe, who is also a military officer, was seen as the only Fako native, closer to winning the race after a Fako native, Reginald Esuka, lastly won it in 1988. Since its inception in 1973, Bakwerians in the male category like John Ekema in 1973, David Ngou Njombe in 1974, Amos Ndumbe Evambe in 1975 and Esuka Reginald in 1988, have all written their names on the Mountain as winners. In 2015, after going for 17 years without the indigenous people of Fako Division (Bakweri) having any of their athletes featuring among the first three, Essombe, in 2015, when he came in the 3rd position, rekindled the hopes of the Bakwerians. After 30 years, the dream of seeing Lyonga Essombe rewrite the history and bring back the glories of those years that a Bakweri indigene climbs the podium as winner of the race, might be delayed.